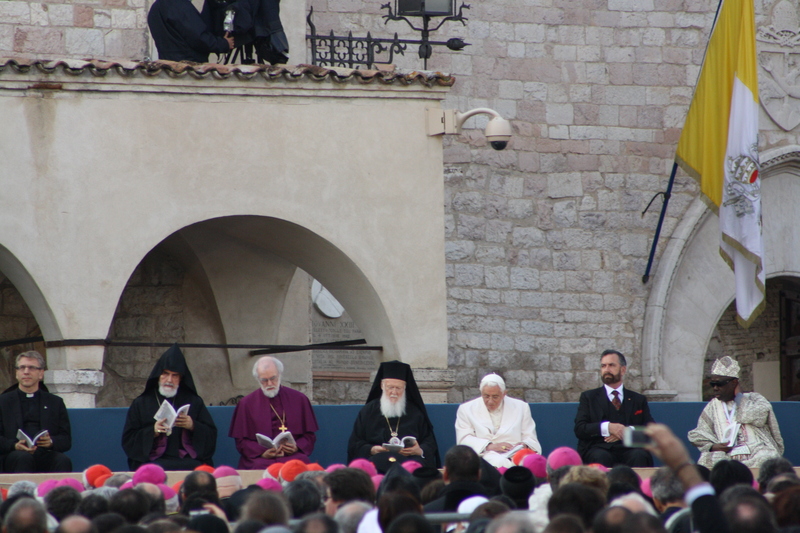 I was privileged to spend yesterday, the Feast of St. Francis of Assisi, in Assisi with Pope Francis. With him came the Council of Cardinals, or group of eight, which held their first meeting this week. It was an overcast, pleasant day, the predicted thunderstorms holding off until last night. His entire itinerary is here, and text of speeches and addresses. There is also a good commentary by a friar i met last year in Assisi at a conference, Daniel Horan, at America Magazine. 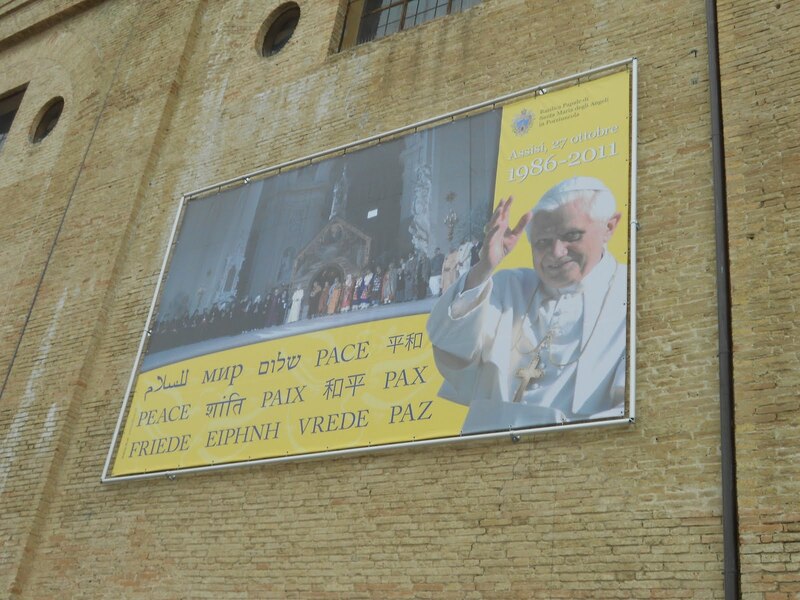 The last papal event I attended in Assisi was the 25th anniversary of the first interreligious day of prayer for peace with Pope Benedict XVI, which was dubbed ”Pilgrims of Truth, Pilgrims of Peace.” Two cornerstone pieces of the original event were missing however – prayer, and the Sant’Egidio community who organize the annual prayers for peace in the spirit of Assisi. Subsequently, perhaps, attendance was surprisingly low. Yesterday was a different story. The Eucharistic celebration in the lower piazza of San Francesco was witnessed not only by a full piazza there, but also in the upper piazza, all the side streets, and in the other major piazzas of Assisi (Santa Chiara, San Rufino, Piazza del Commune) where jumbotron screens were set up. It was an almost all-Italian gathering, and there is no question of the broad appeal of this reforming pontiff. It came at the end of an amazing week in terms of Church news – especially with regard to Church reform. I commented already on some of them, but there has been so much, it has been hard to keep up. Thankfully, there are professionals to do that for us: John Allen summarizes this week in Vatican and Church news, in what he contends to be the biggest week outside of a conclave in his nearly 20 years of Vatican reporting. 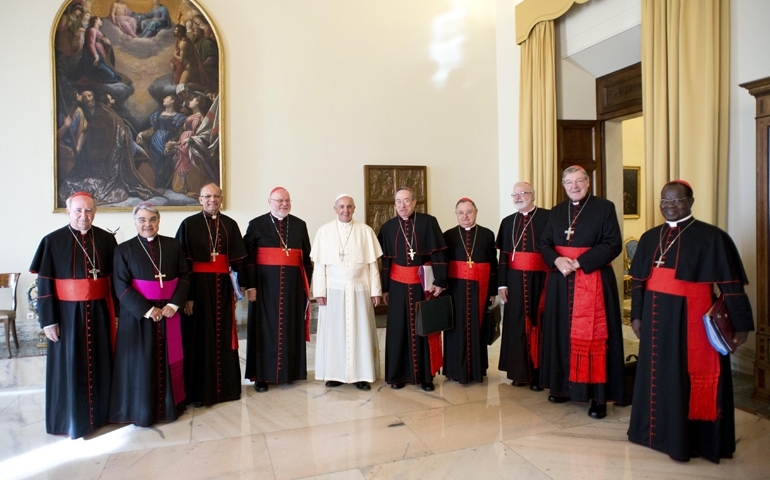 The biggest news is probably the meeting this week of the Council of Cardinals, dubbed in some circles the G-8. They have discussed the ecclesiology of Vatican II, the reform of the Synod of Bishops into a more permanent exercise of synodality and collegiality, the reform of the Roman curia to such an extent as to require a new constitution emphasizing decentralization and service to the local churches, changes to the Secretariat of State that might remove it from its current role as über-dicastery, and serious questions on the role of the laity in the church, including the role of the laity inside the curia itself. Their second meeting is set for just two months from now. They seem to really be addressing the half-finished business of Vatican II, or at least getting started on it. When my students asked me last week why no pope or bishop has ever talked about the Church in the way that Francis has, and why there’s never been so much energy in the church, I was reminded of my own experience as a university sophomore, in my own 200-level theology class (on Vatican II) asking a similar question, “why are we still waiting for the changes promised by the Council? How can 35 years have passed and we are still waiting [on things like decentralization, synodality and collegiality, the role of the laity, the full restoration of the diaconate, overcoming clericalism, etc]?” – I had no idea 15 years later I would be the one trying to answer these questions, and under what different circumstances! Ernst Von Fryberg, cleaning up the Vatican Bank. He really should be a deacon! Not to put too fine a point on it, but that’s what a real “war on religion” looks like. One aim of the book is to reframe the conversation over religious freedom among Western Christians so we don’t allow our metaphorical battles at home to obscure the literal, and often lethal, war on Christians being waged in other parts of the world. In the view from Rome, there was a bit of discomfiture last year with the whole tone and tenor of the ‘fortnight for freedom’ in the U.S., because it seemed to ignore the real problems of religious freedom. Officially, of course, the Vatican backs its bishops, but, unofficially (and remember this was still under Pope Benedict) there seemed to be a current of thought around the Vatican and in Rome that there was a little too much partisan politicking, and not enough focus on the fact that there are more Christian martyrs around the world today than at any point in history. It is hard to be quite so concerned about contraceptive funding when there are Christians dying at the hands of radical elements in Buddhism, Hinduism, Islam, and secular Atheism – especially when it is part of a universal health care plan that the Church supports in principle, if not in every detail. This is, of course, not to say to ignore the small problems before they become big ones, but to keep everything in perspective. That is something we Americans have a hard enough time doing when it comes to global events, but for which membership in a Church so universally oriented that it is called Catholic ought to be a corrective. For the full run-down of the week, read Allen’s article here. Feast of Francis of Assisi . Francis took aim at the ‘right’ by calling on the Church to “strip itself of the cancer of worldliness”, and took aim at the ‘left’ by asserting that the peace of Francis is not a ‘kind of pantheistic harmony with the forces of the cosmos’, but a Christ-centered peace. Though I usually try to spend the night, a visiting friend and I made a day trip to Assisi. I have been there in all seasons but the height of summer, until now. By now, I have reported on all the major sites, and mentioned before my favorite little church, essentially untouched in its 900 year history, Santo Stefano. The diocese is currently planning the church’s (purportedly) first-ever renovation, but it was not clear what that would entail. Hopefully, nothing baroque! As we approached, we saw a small sign inviting us into the adjacent monastery garden for rest and refreshment. On entering we found a small group of pilgrims from northern Germany who were in town with a total of about 20 from their parish, including the pastor, who were spending a few weeks in Assisi offering this simple hospitality ministry in shifts. Shade, water, and greenery with a view was a most welcome respite in the heat of the day (though much cooler than Rome, at 30C/85F it was still hot!). Apparently this is the second year of these groups coming to live a few weeks in Assisi and offer the ministry to pilgrims and tourists. I wonder if they take Americans? 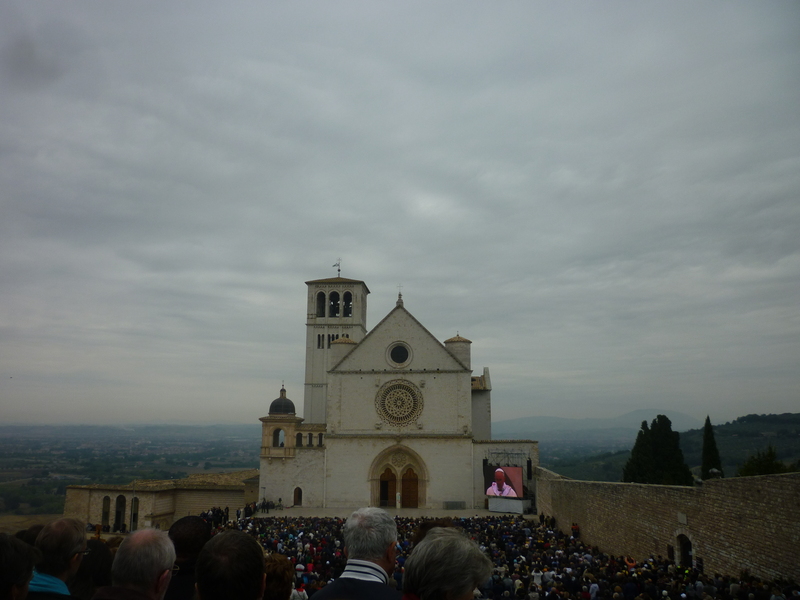 Assisi 2012 – Where we Dwell in Common. So, I have had a bit of a break from blogging, mostly to focus on other writing, and owing to other distractions. Rome can do that. 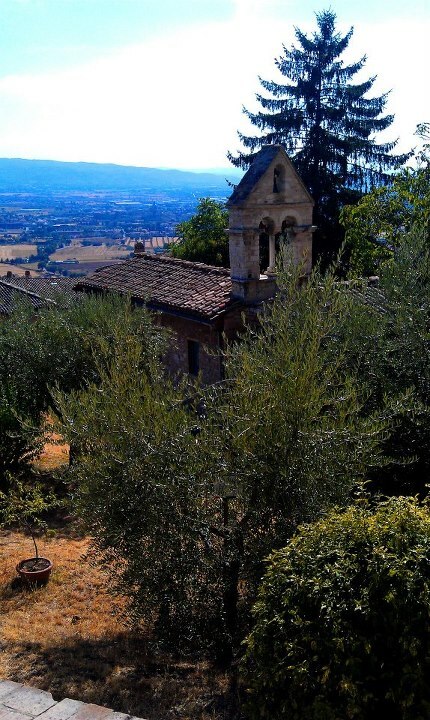 However, I find myself now with about 30 pages of back-notes for blogs, and sitting in Assisi for a conference of the Ecclesiological Investigations Network, so it seemed opportune to begin again with some observations from the first day. 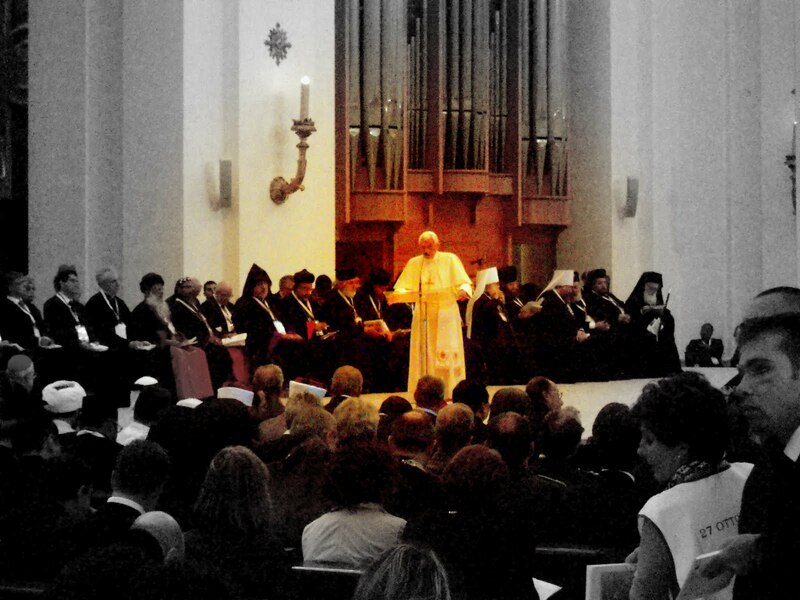 The theme is Assisi 2012: Where we Dwell in Common – Pathway sofr Dialogue in the 21st Century. The three thematic tracks are intra/inter ecclesial issues (ecumenism/ecclesiology), interfaith/interreligious issues, and Faith and World/Culture. We arrived yesterday and started with an opening plenary prayer in the Basilica of Santa Maria degli Angeli, home of the Porzincula, and greeted by Assisi Archbishop Domenic Sorrentino and Friar Fabrizio Migliasso, Custodian of the basilica. There are a few familiar faces (Peter Phan, Rick Gillardetz, Dennis Doyle, Michael Kinnamon), and a few names I finally get to put faces to (Paul Murray from Durham, the other Viggo Mortensen). But I confess I am a little surprised how few I knew or knew of – one more reminder of how insulated pontifical academia can get. Participants number over 200, from 55 countries, and several different churches and faiths. The opening panel offered insights into the theological situation in Italy for the participants, and the opening keynote was offered by Paul Arthur of North Ireland, offering lessons from the peace process there for dialogue initiatives. Peter Phan offered a humorous evening toast, and Dennis Doyle delivered a deadpan response. This morning began with a plenary panel composed of Brad Hinze (US), Mary Getui (Kenya), and Eleni Kasselour Hatzivassiliadi (Greece) and a response from Deivit Montealegre (Argentina). The Burdens of History: Must Tribalism Always Prevail? The afternoon held smaller breakout sessions with panels of smaller papers, and more direct discussion. I chose one with a Chilean and Tanzanian students from Louven, and Michael Walsh, the British church historian. He offered a look into an as-yet unpublished encyclical of Pius XI, Ecclesia Christi – On the True Church of Christ. It is one of two released in the archives of his pontificate. It is so healthy, and people are so approachable. It is like a retreat, except that daily life in Rome is like a retreat, so I guess having a packed schedule is the retreat from the retreat. Having the daily intellectual stimulation with world class scholars is a nice break though. It is such a culture clash from the daily pontifical experience though, nobody is here speaking in official capacity, and everyone is quite open. No holds barred in critiquing the narrowing hermeneutic of the Council, calling to task shoddy scholarship, or directly challenging other churches for inconsistencies or unusual doctrinal stances. I present on Friday, offering some observations on non-priestly ministries as opportunities for ecumenical convergence. Diaconate and lay ecclesial ministry anyone? For Avner, an Israeli Jew, Yom Kippur this year meant spending the day at a Benedictine retreat center with his new housemates and attending his first Catholic mass. It inspired him to fast for the Day of Atonement for the first time in years. For Kassim, a Muslim father of three from Ghana, his first Sunday in Rome was marked by the celebration of the Eucharist as well – at St. Peter’s Basilica with Pope Benedict XVI and all the bishops of Africa, including Cardinal Peter Turkson of Ghana. Matthew, a Christian born in Singapore and living in Australia, experienced for the first time a Shabbat meal with a rabbi; Muhamed, a Sunni imam from Bosnia studied the liturgy of the hours in the Latin tradition alongside a Belarusian Orthodox scripture scholar and a Syro-Malabar Catholic liturgist. When a rabbi, an imam, and a minister sit down together, it sounds like the beginning of a joke. Mention that they are housemates, too, and you suspect there is a punch line coming. Add that this is in the heart of Rome, in a Catholic residence for students of the Pontifical Universities in the Eternal City, and your skepticism is almost justified. For twenty-five years, however, the Lay Centre at Foyer Unitas has been just that: a Catholic collegio committed to the formation of future theologians and church leaders in their Catholic identity – and precisely by virtue of that commitment, also a house of hospitality to ecumenical and interreligious scholars in Rome. The Lay Centre was founded by Dr. Donna Orsuto, of Ohio, and Ms. Riekie van Velzen, of the Netherlands, in 1986 – a time when, surprisingly, there were still very few lay students in the pontifical universities, and when no Roman collegio was open to people who were not priests, seminarians, or religious. It was born out of the Foyer Unitas (literally, Hearth of Unity) of the Ladies of Bethany, which they had operated since 1952 as an information and hospitality center for non-Catholic pilgrims to Rome, including some of the ecumenical observers at Vatican II. During the recent twenty-fifth anniversary celebrations, the co-founders, Dr. Orsuto and Ms. van Velzen were honored by Pope Benedict XVI as Dame of the Order of St. Gregory the Great, and Dame of the Order of Pope St. Sylvester, respectively. To provide a formation program for the resident student community based on the four pillars of Christian formation identified by the Holy See: spiritual, intellectual, human and pastoral. To provide ongoing adult faith formation to the expatriate Anglophone communities of Rome. To provide a series of international programs giving church leaders from around the world a unique opportunity to explore the history and theology of Rome. There are currently twenty-two residents of sixteen nationalities and from five continents. They are agnostic and Jewish, Shi’a and Sunni, Orthodox and Catholic (even Latin and Eastern!). In such a milieu, there is ample opportunity for a dialogue of life and hands-on learning from a cross-cultural context. Food and mealtimes always provide such occasions: One student is vegetarian, the three Muslims have three different approaches to halal, and during advent the Orthodox have gone temporarily vegan. As an Italian dinner is never complete without wine on the table, the Sicilian blood-orange juice was redubbed “Muslim red wine” by those not permitted to partake of the Christian variety. Dinnertime conversation can range from the World Cup to circumcision practices in Judaism, Christianity, and Islam. A trip to the kitchen for a midnight snack can turn into a two-hour conversation about different religions’ perspectives on agnosticism and secularity. As a lay Catholic Christian community, the prayer life of the house is decidedly in that tradition; members of other churches are welcome to participate, and members of other faiths are welcome to observe, as appropriate. Before the main community meal of the day, all who choose to do so pray either midday prayer or vespers in common, and every day ends with a form of night prayer. A weekly community night includes the celebration of the Eucharist with a guest bishop or priest, dinner, and a formation session. Meal prayers might come from any tradition and be in any language. Prayer also presents the opportunities for respectful presence and observation at the prayer of another religion, like the Jewish and Muslim encounters with the Mass mentioned above. Prayer can be a time for hospitality: During a recent evening event, one of the Muslim guests asked his Lay Centre hosts for a quiet place to pray maghrib. One Catholic resident immediately went to his room to retrieve a prayer mat he kept for just such occasions, as the other resident volunteered to wait during her friends’ prayer to make sure he was not disturbed. 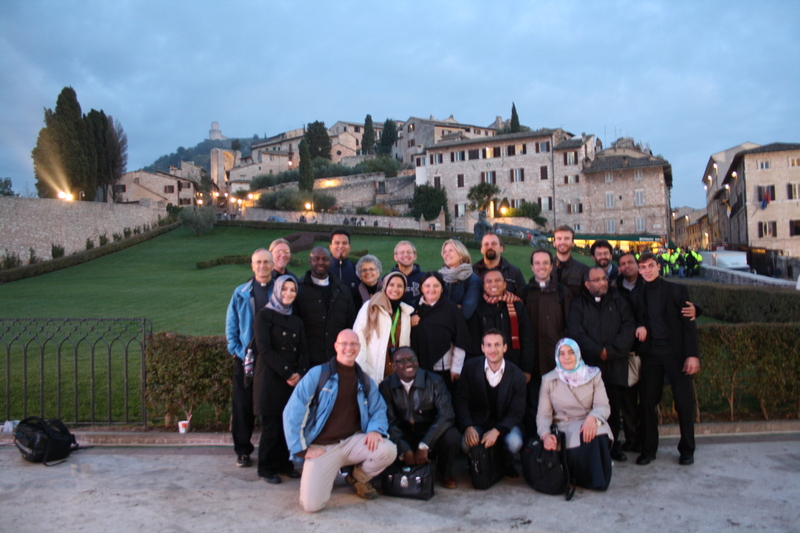 In October, the Lay Centre organized  a pilgrimage to Assisi to join Pope Benedict XVI and other leaders of the world’s religions for the Pilgrimage of Peace, Pilgrimage of Truth,marking the 25th anniversary of the historic first interreligious gathering in Assisi with Pope John Paul II. Though the official agenda included several speeches and declarations of commitment to peace, no form of common prayer was scheduled. Prayer, pilgrimage, and community are separated only with difficulty, however. As the group wandered around the ancient town for half an hour before dinner, some found their way to San Stefano, a simple 12th century church. Instinctively, Christians made their way to the front benches to quietly pray, while in the vestibule, an imam and a dervish began their own prayers. Our agnostic housemate took time to reflect outside with a cigarette. Like the medieval church in which we found ourselves – simple, quiet, and peaceful – the prayer and reflection expressed our unity and our diversity. 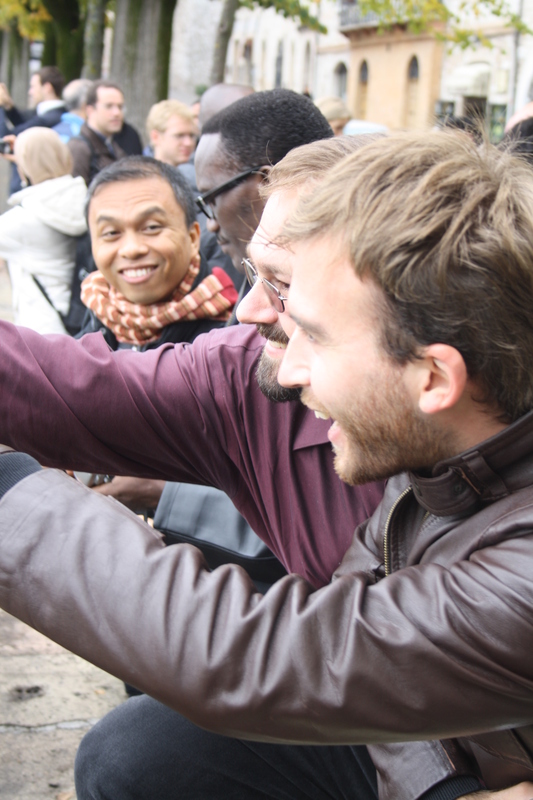 It is precisely this community without communion which marks life in the Lay Centre at Foyer Unitas and makes it an oasis of hospitality and dialogue in the heart of Rome. 1 In the Pontifical Roman system, Universities are the accredited institutions of post-secondary education. Colleges, which are generally seminaries, are the residences and houses of formation where most university students are presumed to live and receive the balance of their formation. The official Christian delegates included Patriarch Bartholomew I of Constantinople, Archbishop Rowan Williams of Canterbury, Archbishop Norvan Zakaryan of the Armenian Apostolic Church, Secretary General Olav Fyske Tveit of the World Council of Churches. In all, there were representatives of the Orthodox Churches from the Patriarchates of Constantinople, Alexandria, Antioch, Moscow, Serbia, Romania, and the Ukrainian, Belarusian, Cypriot, Polish and Albanian churches. The Oriental Orthodox were represented by the Syrian Patriarchate of Antioch, the Armenian Apostolic Church (both Catholicossates) and the Malankara Orthodox Syrian Church. The Assyrian Church of the East was represented by the Metropolitan of India, the bishop of California and a priest. The Anglican Communion, the Old Catholic Church, Lutheran World Federation, World Communion of Reformed Churches, the World Methodist Council, the Baptist World Alliance, World Convention of the Churches of Christ, the Mennonite World Conference, the World Evangelical Alliance, and the World Council of Churches were all represented, along with the Church of Scotland, the Disciples of Christ, the Salvation Army, and the classical Pentecostal churches. 176 representatives of non-Christian religions were present, including Reform and Orthodox Judaism; Sunni, Shi’a, Alawite and Ismaili Muslims; Hinduism (including Rajmohan Gandhi, grandson of the Mahatma); Jainism; Zoroastrianism; Buddhism (including Shaolin, Zen, Tibetan, Theravada, Tendai, Jogye, Jodo-Shu, and other forms); Confucianism; Taoism; Shinto; Mandaean (Gnostics); Sikh; Baha’i; traditional African, American, and Indian Religions; and “new religions” such as Tenrikyo, Ennokyo, and Myochi-kai. 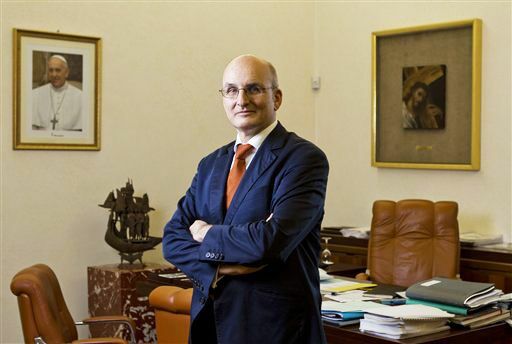 Four “non-believers” were invited, a first, emphasizing Pope Benedict’s interest in the New Evanglization and his effort to engage secularism and religion on a level of common interest in the quest for truth. These included Julia Kristeva, Bulgarian-French psychoanalyst; Guillermo Hurtado, the Mexican philosopher; Walter Baier, a politician from Austria; and Remo Bodei an Italian professor of Aesthetic and philosophy.